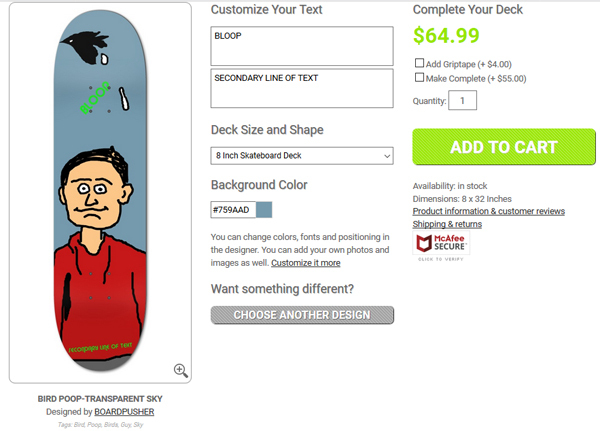 Here’s a simple way to create a one of kind custom skateboard deck on BoardPusher.com. Visit our Personalize a Design page and type a personal message or your recipient’s name into the text boxes then select a design from a list of dozens of background graphics. 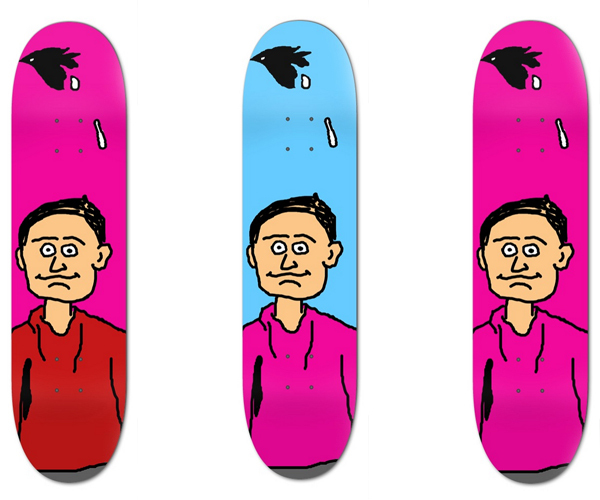 Your skateboard is now ready to go and you can add complete components (wheels, trucks, etc.) to your order, too. 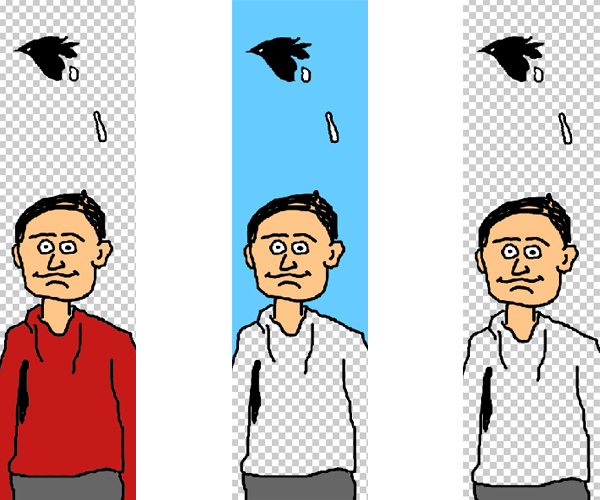 Not happy with the font and/or color? No problem! 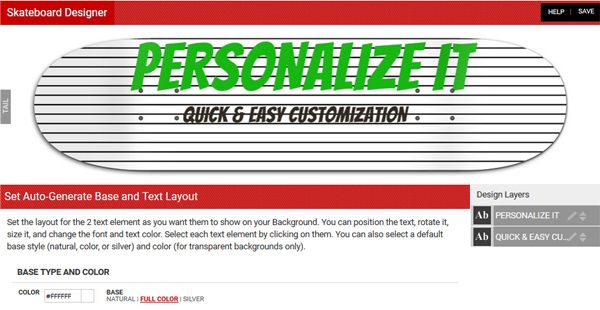 Click “EDIT DESIGN” and use our easy to navigate designer to update your text or select a different background. Remember to use coupon code FRSHP to get free shipping on all US ground orders. Still struggling to find that perfect custom Christmas gift? Through a couple of quick and easy steps, you can personalize a skateboard deck with your gift recipient’s name and/or a personal message from you. Just go to our Personalize A Design page and there you can enter your text, choose a deck size, and then select a slick looking graphic and you’re all set with a customized skateboard for that special shredder in your life. Still looking for that perfect gift for that hard to shop for person on your list? 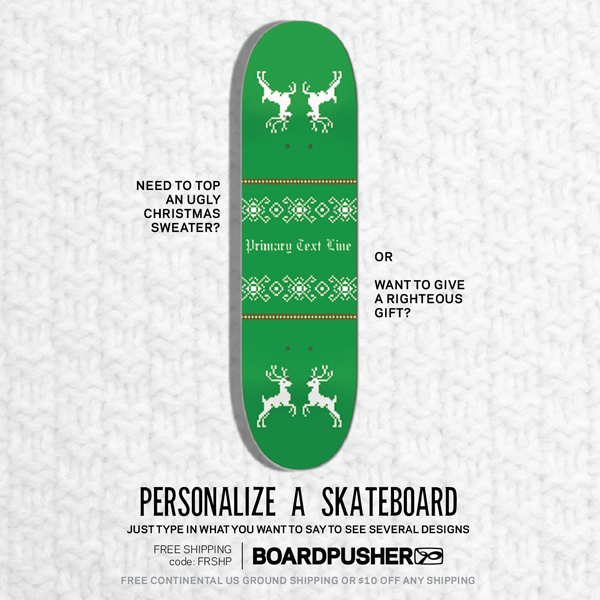 Why not personalize a skateboard for him or her? We have a host of artists’ backgrounds to choose from and through December 10th we’re offering a free $10 upgrade so that you can personalize one of these awesome designs for the skater in your life. 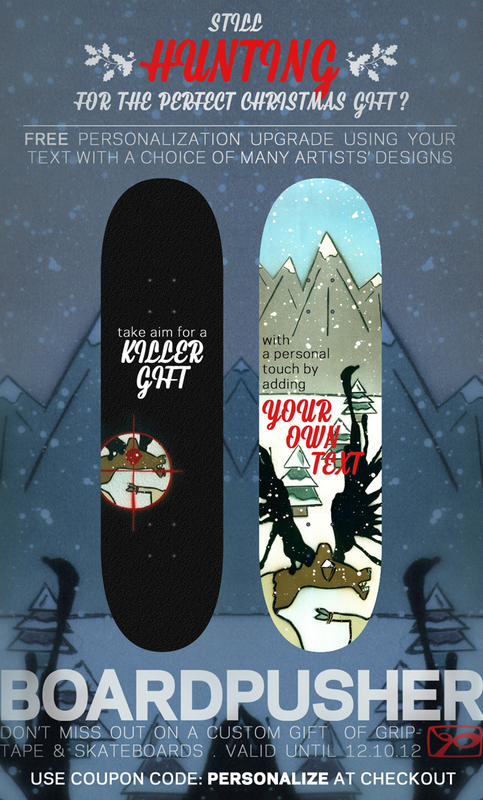 Pick from any of the designs at http://www.BoardPusher.com/Personalize then add and arrange your text and even choose from a selection of different fonts. Just type in the code PERSONALIZE during check out to get your $10 coupon. This is also an opportunity to support up and coming artists as we will be picking up the tab so that they still receive their proceeds for their graphic. Don’t forget to check us out on Facebook at http://www.facebook.com/boardpusher so that you can enter our free complete skateboard giveaways.